Is he standing on top of that pillar? We’re back! Miss B has had a bit of a spell of providing verdicts for games, so you should see a few new posts over the next mumblemumble period of time. First up we have a lovely looking game about making mosaic floors in the Taj Mahal called Maharani. We’ve had the game for a while, and Miss B spent a happy time a year or two back just playing with it and making patterns with the tiles, but we have only just got around to playing it. A blue worker goes to work in the peacock corner and then stops for a cuppa. This is a game that is pretty much a classic Euro-style game where you are mostly working on your own project, and you can get in the way of other players, taking a tile or blocking off a space they wanted, but they will usually have other good options and can just get on with their life after a mild bit of fist shaking. And it’s all about earning points in ways that don’t really make a lot of thematic sense, but that’s OK because you are building something that looks nice using colourful tiles and little wooden workers. In the case of Maharani, most of your turns are spent placing tiles onto the large floor plan, selecting your tiles from a rotisserie selection in the middle, and sometimes you also get to place workers on the new tiles. You earn points for having groups of tiles of the same colour and for having workers standing near each other (which requires different colour tiles because reasons), and then when each quarter of the floor is complete, you score bonus points according to the number of workers you have in the area. It all sounds a bit dry, and maybe it is, but the components are so nice, and there is really something special about painting the board in those bright colours as you go. Miss B missed a couple of rules when I was explaining them, which was all sorted a couple of turns in, and then things flowed very well. It took us about an hour to play, and I think Miss B was getting a little bored towards the end when there were only a few tiles left and a handful of places to put them, so it was just a matter of figuring out the moves that eke the most points out of the last few turns. But the scoring of the last two quarters of the board towards the end lifted things up and made things more exciting. To be honest, I love this sort of game, so it was great to get to play it with Miss B, even though it didn’t really fire her up. Hopefully a rematch will happen one day, though. The game: Maharani (Queen Games), 2 to 4 players aged 8+. The elf has escaped with his wand! 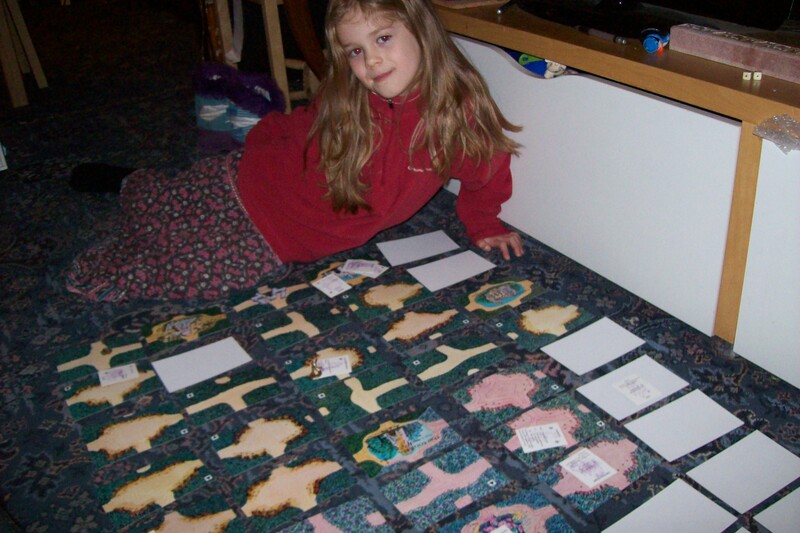 Many years ago I got introduced to Mystic Wood, which was a really cute game where you get to be a knight on a quest and explore a forest by flipping large, randomly arranged tiles representing paths and glades within the wood and drawing cards to see what you encountered on your journey. It had most of the good elements of Talisman, and played in a fraction of the time. Plus it was so big you generally had to play on the floor, and my friend, whose game it was, had blinged his set by replacing the uninspiring pawns with painted up 15mm wargames miniatures of mounted knights. Modelling the game today is Miss B, playing the part of Britomart, who looks uncannily like Red Scorpion. Anyway, I’ve had an eye open for this long out of print game ever since (and more recently I thought it might be something Miss B would enjoy), until over the Christmas holidays I found a second hand copy in good condition in a shop in Oxford, so bought it right away. We got to play the game a few days later, spreading it out on the sitting room floor and, at Miss B’s suggestion, using miniatures from Runebound to represent our characters. The game plays as quickly and easily as I remember, and although there are times when you miss a turn or have nothing to do but trudge across the map or roll a die to escape captivity, turns generally take so little time that it doesn’t matter too much. We did implement a house rule or two to reduce some of the duller “miss turns” effects, but there aren’t many of those. Probably our biggest problem was when one magical effect rotated half of the map tiles, meaning that our previous routes around were no longer possible, causing some very minor frustration for a while until Miss B found a way to start getting herself teleported around. There is another potential problem in that the quests of the knights can be scuppered by the others. For instance, Miss B was on a quest to find the Prince, but I located him first and could, possibly, have persuaded him to come along with me, meaning that Miss B would have had to catch me and joust in order to steal the Prince from me. This isn’t really a problem as such, but we chose to sidestep this by deliberately evading the objects of each others’ quests. Maybe next time we will play the game a bit more as intended. In the end, Miss B won easily, with me stuck trying to get past a nasty monster that was blocking off a whole section of the wood while I tried to complete a side quest. It probably took us a little over an hour of actual playing time (we paused mid-game due to a visitor arriving), and felt fun and engaging throughout. Hopefully this will come out a few more times in the next few months. I’m definitely happy with this find. The game: Mystic Wood (Ariel), 2 to 4 players aged 9+. Where needs a yellow diamond? Abstract games are not really for everyone but, then again, games with prominent themes can put off as many people as they attract. Quirkle seems to have found a place in the world, though, as an abstract game that finds its way into mainstream retailers as a “family strategy game” and is also enjoyed by many hobby gamers. Basically it just involves scoring points by making rows of colours and shapes by placing chunky tiles into a growing cluster on the table (or floor). 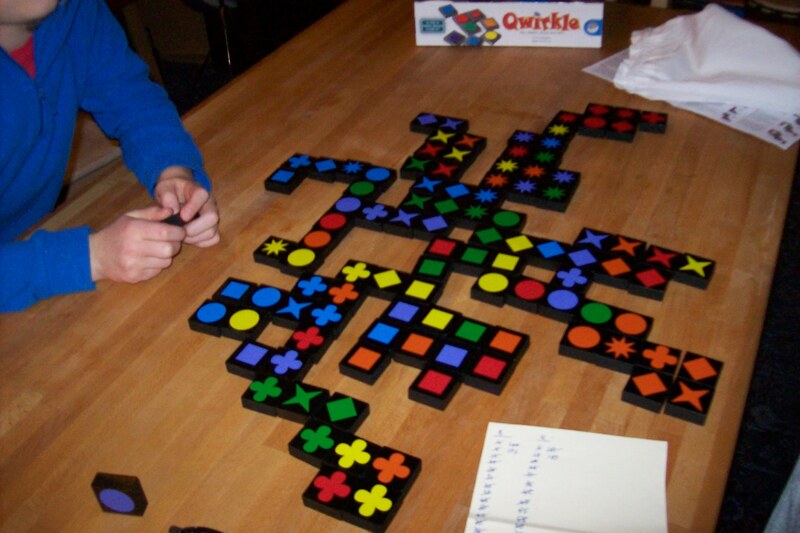 If you want to see it played, Qwirkle recently featured on Wil Wheaton’s Tabletop show. Nearly finished. Pretty isn’t it? We’ve played a couple of games of Qwirkle so far, and I expect we’ll play it some more. Miss B enjoyed the games in retrospect, but during play things got a little… fraught. I think the problem is that Miss B has got to grips with the game enough to know that she is trying to find the best score she can for her plays, but hasn’t developed the instinct for actually seeing good moves. This is the sort of skill that gets learned with repeated plays, but for the moment her turns take a very long time, and often result in her needing some help to spot her best options. She is also having difficulty seeing how you can score “round corners” while only placing tiles in a straight line. This can all lead to frustration and a game that takes far longer than it should. I’d say we are in a tricky situation at the moment. If Miss B thought about games less, she could probably just play tiles where they look nice and have a good time. If she knew the game better then she’d be able to make stronger plays without help (at the moment she is reluctant to accept help as she seems to feel that she should be able to “get it” herself). All we need here is practice. I think the game is good enough, though, that it is probably worth persevering. It has occurred to me that if I remove half of the tiles of each type from the game we should have a much quicker game that could work well for training purposes, although we’ll have a lower chance of getting the bonus “qwirkle” plays where you get six tiles in a row. One serious problem with the game, by the way, is the colours on the tiles. The whole thing looks and feels lovely but in less than perfect lighting conditions sometimes it is hard to tell some of the colours apart, even for people with normally no colour vision problems. Unfortunate. I’ve heard of some people writing on the tiles to help with colour differentiation. The game: Qwirkle (The Green Board Game Co): 2 to 4 players aged 6+. I picked up a game called Enuk at The Works just before Christmas. It is supposedly about a little Eskimo (that’s the term used in the game, even if it isn’t correct) boy helping his parents build an igloo while looking out for arctic wildlife. It looked cute and the reviews and ratings on The Geek weren’t bad for a kids’ game, so I picked it up. Two bears and some herring… Do we risk another tile…? This very much is a kids’ game. But what stops this from being a tile-matching memory game is a really neat little press-your-luck mechanic. You see, you turn over tiles and can keep turning over tiles until you choose to stop, you find a piece of the igloo, or animals start scaring each other off. Herring flee from salmon; salmon flee from seals, seals from polar bears and polar bears from reindeer accompanied by humans. So when you have turned over a few tiles you have to decide whether to claim those for your scoring stack, or turn over another and risk losing several tiles due to one of these fleeing issues. I really rather like that. And Miss B, after a little confusion for the first couple of times, got to really enjoy this aspect of the game. Our first game was over remarkably quickly — when eight reindeer tiles have been drawn, the day ends and there is a special memory round for people who have managed to find bits of the igloo. So we had a second game, which used up pretty much all the tiles. Miss B won comfortably in both games. I quite like this. The game is very random indeed, but due to it rewarding some memory, it is less so than most dice games, and that press-your-luck aspect makes the game feel rather more meaty than I had expected. It’s not enough that I would play this with an all-adult group, but it’s definitely a worthwhile purchase and Miss B is keen to play it again. 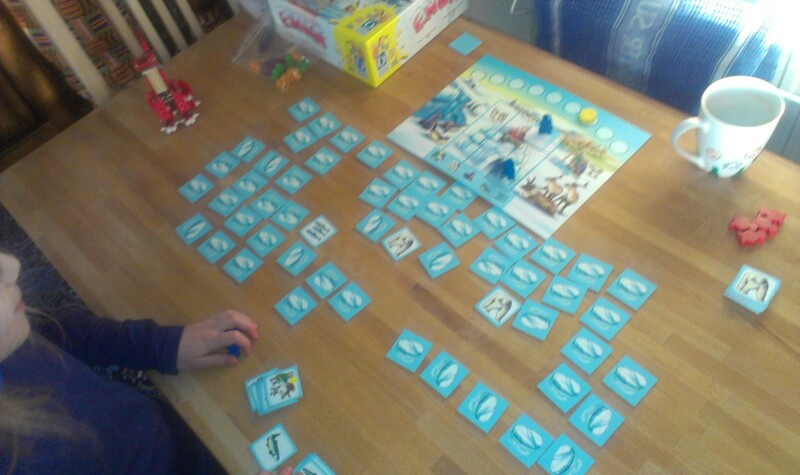 The game: Enuk (Queen Kids), 2 to 5 players aged 5+. Why are those two knights fighting? Oh, they have different shields. Castle Keep is another game from Gamewright, who make a pretty impressive range of games for kids/families which are often available in high street toy shops, which has to be a good thing. This one has been on my radar for a while, but we have only just got hold of a copy and played it. Just about to win with that red zigzag wall. If only all castles were as colourful. So the game is about trying to lay tiles to complete construction of a castle in a 3-by-3 grid, with towers in the corners, walls connecting the towers, and a keep in the middle. The trick is that tiles come in three colours, and the walls and towers are each in one of three shapes, and you have to match adjacent colours and shapes to each other. You can also knock down sections of an opponent’s castle by playing a matching tile onto them. Miss B is not generally a fan of direct conflict in games, so we played a game where we were just racing to build a castle. It took a couple of turns to fully get to grips with the shape matching (round towers match with wavy walls, diamond towers to zigzag walls, and square towers to straight walls) but then we were off in full flow with Miss B winning, before insisting that I took some extra turns to make sure I could finish my own castle. Miss B wanted to take some photos herself. This is one she took of a pair of complete castles. Perhaps I should let her do all the photography! We discussed introducing the attack rules for a second game and Miss B decided to keep them out. Then a few turns in, she spotted that she could knock half of my castle down in one go, developed a twinkle in her eye and announced that she had changed her mind and that it would be OK to do attacks. 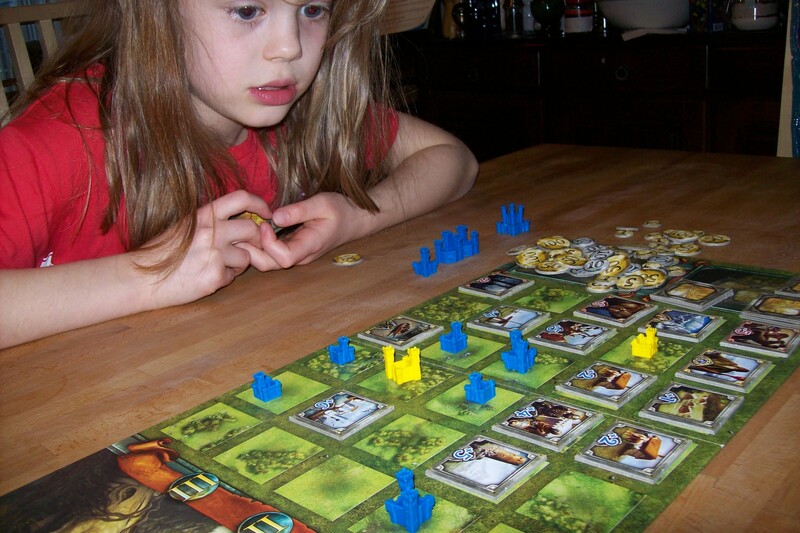 The game: Castle Keep (Gamewright), 2 to 4 players aged 8+. Café International is quite an interesting tile placement game where you score points by arranging people at restaurant tables according to a few simple placement and scoring rules. The tiles depict cheesily stereotyped (some would say offensively so) men and women from various nations (plus a continent, in the case of Africa), but ignore all that and you have a pretty neat abstract game which I’ve really enjoyed playing in the past. Miss B spotted the box on the shelf and asked to play it. I couldn’t think of a good reason not to, so a short while later we were setting up on the dining table. The game is fairly intuitive to play, though some of the subtleties of scoring can be a bit tricky (like what happens when you place a person at two tables). Miss B also obsessed a bit about the bar and the negative scores to be had for late arrivals. In the early stages of the game it can be quite tricky as you have a lot of space and arranging people so that they have a dining companion can sometimes be awkward. Towards the end, there are only a few seats left at tables and you will inevitably end up with some unplacable tiles, which can get frustrating too. All in all, I think that the mechanic works well, but the game is a little too big and long to work well for Miss B. A cut down version with easier scoring might work very well indeed. 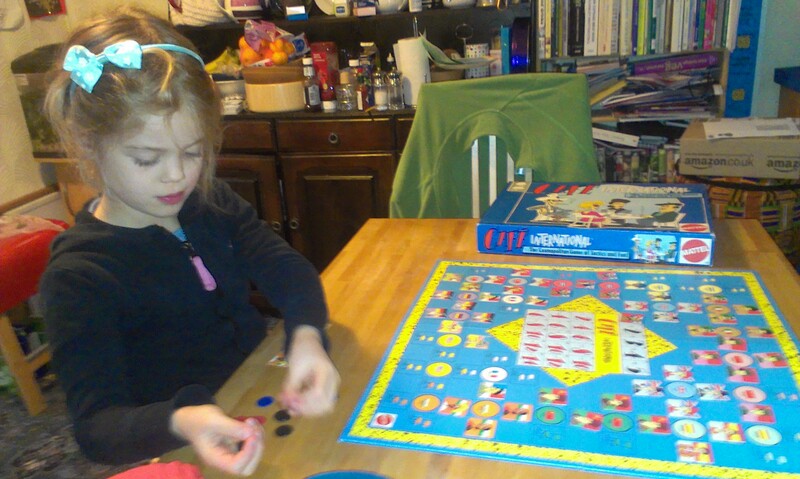 The game: Café International (Mattel), 2 to 4 players aged 10+. If I turn the chariot like this can it go sideways?